Get ready for Christmas with an early gift! If you haven't started The Iron Series yet, now's the time. 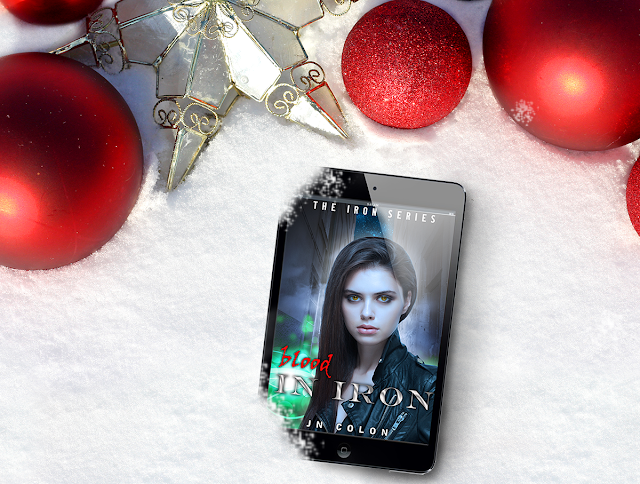 Blood In Iron (The Iron Series Book 1) is FREE Dec 12th - 16th. Demons, demigods, and forbidden love... Begin the dark urban fantasy. Kory has never been afraid to walk down a dark street at night for two reasons. One, she can see the villains skulking in the shadows, hear their footsteps as they approach, feel their presence closing in. And two, on any given day or night she's more dangerous than them. Or so she thought. When the rebellious teen discovers the true evil underbelly of Bishop City, Kory's life and all she's even known is irrevocably shattered. She's caught between simply surviving and following the path she never knew existed. Rex becomes her teacher and the chemistry between them is both undeniable and forbidden. Relationships and loyalties are tested and, as Kory falls deeper into this new supernatural world, dark secrets arise, hinting that her destiny might be more than she bargained for. Is she simply another demon hunter, or is her blood the key to something darker? And if you're a fan of the series, soon there will be a chance to receive an advanced copy of Book 4. Just make sure you're signed up for my newsletter and you'll get more information on how to get your free, early copy soon.